For the second year in a row, we headed to Rasa’s hometown of Mažeikiai to celebrate Christmas. This year, though, was going to be a bit different. Rasa has a job now, so her time off schedule is quite different. Instead of being able to spend a leisurely week or so as we did last time, we only had a few days, counting the weekend. So instead of relying on relatives, friends or public transport, we decided to rent a car for the few days. It gave us more flexibility and freedom. Naturally, we rented the smallest, least expensive car we could because, well, we don’t need a huge amount of comfort. So I go through rentalcars.com, which actually has some pretty good deals. I used them for our trip to the US and it was great. So we make the booking, and Monika drops me at the airport to pick up the car. The first snag comes when I realize the car rental company listed on my paperwork doesn’t exist. In fact, the whole car rental are in the airport is a bit weird. There are about a dozen rental counters, but only a third are staffed. This is primarily because there are only 6 flights coming in to Kaunas that day so there isn’t a lot to do. Eventually, I ask one of the occupied desks where I might find the company from which I have allegedly rented a vehicle and it turns out the company name I have is merely the Lithuanian franchise owner for Enterprise. Whew. There is an Enterprise desk so that’s no problem…except it’s one of the ones which is not currently occupied. This could, of course, be my own fault as I had scheduled a 3pm pick-up and I was there well before 2 due to scheduling changes. Finally, the woman working the counter arrives and we get everything sorted and I get the car. It’s a tiny Hyundai i10 but everything seems to be in order so I gleefully get behind the wheel (a place I haven’t been since the States) and immediately get sent on errands before going to pick Rasa up from work. It’s raining heavily so it takes a while and on the 23rd of December, when she should have gotten out an hour early, she ends up being stuck there until almost her regular departure time. Of course, being that we’ve both been working on various things, we hadn’t packed at all, so we pop home, grab presents and throw clothes (neatly) into the suitcase, convince the dog he wants to take a ride, and off we go for the three hour ride north. Arriving, we are immediately fed (Rasa’s mother is right up there with mine when it comes to making sure you’ve got enough to eat), have a bit of a chat and then bed. Christmas Eve morning we have a nice lie-in because there’s not much to do. There will be a lot of cooking and eating for later, but for now, we’re relaxed. We run a few errands, pick up some last minute shopping, help around the place and await the family. Like last year, Christmas Eve dinner was at Rasa’s Mom’s place and with 11 of us sitting around a small table, it was cozy. The meal served on Christmas Eve did not include meat, milk products or eggs. Even so, the meal was memorable. It consisted of twelve dishes, one for each Apostle. Typical dishes were beet soup, mushroom-filled dumplings, herring and other fish, bread, boiled or baked potatoes, cooked sauerkraut, mushrooms, dice-sized hard biscuits with poppy seed “milk”, cranberry pudding, and whole wheat with honey. Food was washed down with homemade cider. The meal was eaten leisurely and solemnly. Everyone was expected to eat some of each dish served; it was considered unlucky to skip a dish. Leaving the table before everyone was finished eating was also considered unlucky. Yup… we had ’em all. The evening didn’t go late, but that’s okay, it was made up for the next day, when everyone came back at noon to celebrate for real. When eating stopped, the mood lightened and diners turned to old legends and to prognostications about the coming year. This was a very special night and on such nights extraordinary things were thought to be possible. Children were told that at one mystic moment that evening the water in the well would turn to wine and that the animals in the stable would speak like humans. Marriageable daughters would go outside and bring in kindling wood to be counted – even number indicating a marriage in the coming year. Straws of various lengths were placed under the tablecloth and drawn to predict the length of one’s life or the length of one’s single life in the case of the young family members. A clear and starry sky on Christmas Eve was thought to portend a good year. We used handfuls of Kūčiukai instead of kindling and Puka, the rabbit’s food as the straw, but yup, did it all – and more! Saturday, the second day of Christmas was a relatively lazy day. Since we had the car, we were able to go out and see Rasa’s sister’s at their homes without inconveniencing anyone to have to come and get us. That night, though, was something different. 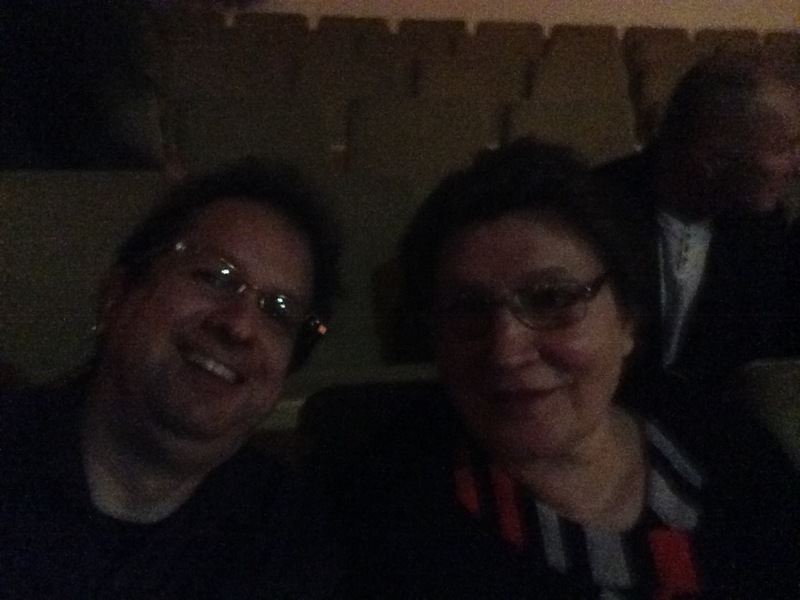 Rasa’s mom had gotten us and Rasa’s eldest sister tickets to a Christmas concert put on by Romas Dambrauskas, a 55 year old pop star. Not only is he from Mažeikiai, but for a long time, he was Rasa’s neighbor, living across the hall from her while she was growing up. It seems he was doing two shows in the Mažeikiai Kulturos Rumai, the municipal concert hall. We had tickets for the second show, slated to start at 7pm. Unfortunately, Rasa was a bit tired and really wasn’t up for going so, after a bit of debate, Rasa’s Mom and I went. Last year I experienced the Mažeikiai Mažeikiai basketball game and this year I got a concert. It wasn’t bad, aside from the fact I didn’t understand any of it (but then, I don’t understand La Bamba either) but it was not at all what I was expecting. Instead of a 90 minute concert of a city’s favored son, it was a two and a half hour variety show, with Dambrauskas as the nominal MC and the other acts not only included singers, but also a magician dressed as a 17th century French courtier and two different dance troupes. The sound was… odd. When Dambrauskas was talking, the background music was up too loud and while there was a live band, they were only utilized for the star’s songs. All of the others sang to prerecorded tracks. There was a large projection screen on the stage which sometimes showed random images and sometimes videos of the performers, singing the song they were also singing live. The lighting design was built to ensure as little front visibility as possible (seriously, there was a general front wash and that was it) with all sorts of background lights. The net result was the performers were often in shadow. There was no pacing to the show, so the audience wasn’t sure when it was over, to the point that half of them were leaving while he was still talking. My theatre friends would have been going nuts about 10 minutes in (I haven’t even mentioned the raffle giveaway of umbrellas and tickets to his Valentine’s Day concert) and yet 90% of the crowd seemed to be having a wonderful time. I think this guy is like a post soviet Tom Jones and the crowds love him. The next morning we were up and packed fairly early, getting home in time to still use to car to do a bit of shopping. 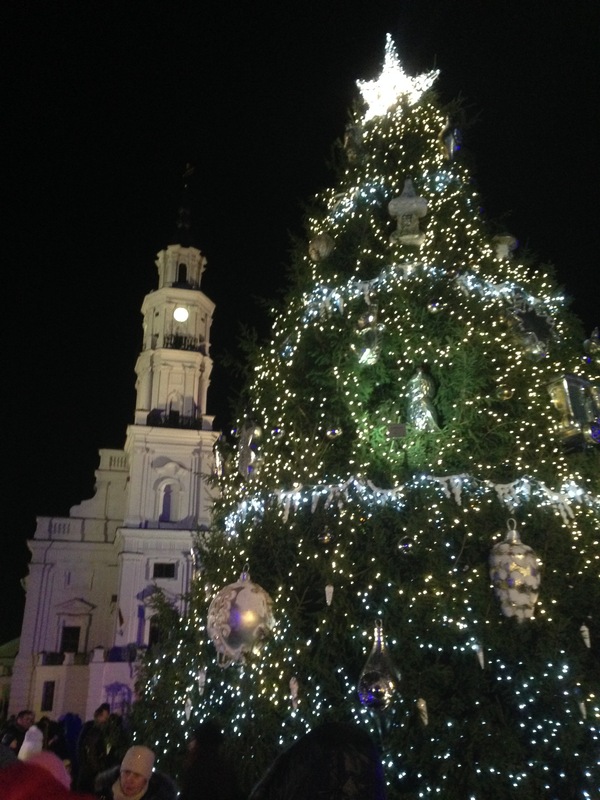 All in all, another fun Christmas in Lithuania.